NASHVILLE, Tenn. (Mar. 7, 2019) – There were 2,536 home closings reported for the month of February, according to figures provided by Greater Nashville REALTORS®. This figure is up 2.8 percent from the 2,466 closings reported for the same period last year. 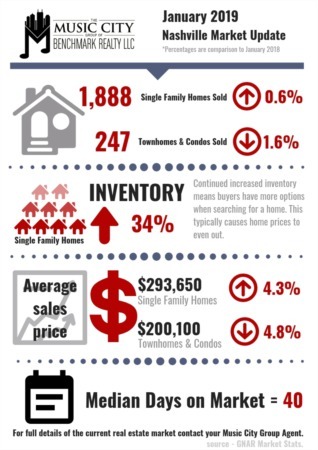 There were 2,974 sales pending at the end of February, compared to 3,307 pending sales at this time last year. The average number of days on the market for a single-family home was 43 days. The median price for a residential single-family home was $294,486 and for a condominium it was$214,900. 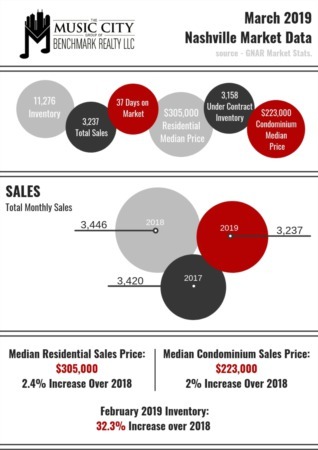 This compares with last year’s median residential and condominium prices of $289,093 and $214,250 respectively. Inventory at the end of February was 10,745, up from 8,359 in February 2018. "We are pleased to see inventory continue to increase in various price points allowing more options for consumers. This combined with the still growing home sale prices show a very optimistic outlook as we head into the spring months," added Terrell.